The below list shows the permission groups that we ask the Assembly User to be a member of on SIMS. This combination of permissions covers the wide range of data scopes that could, with your authorisation, be exposed to the Platform. We ask for these scopes when you sign up because we don't want schools to have to keep adjusting or adding SIMS permissions whenever they use a new app. The important thing to note is that by creating a SIMS user for Assembly with these permissions, you do not yet give us permission to access any of your school's sensitive data. All you are doing is setting the parameters with which data could be transferred at a later date. 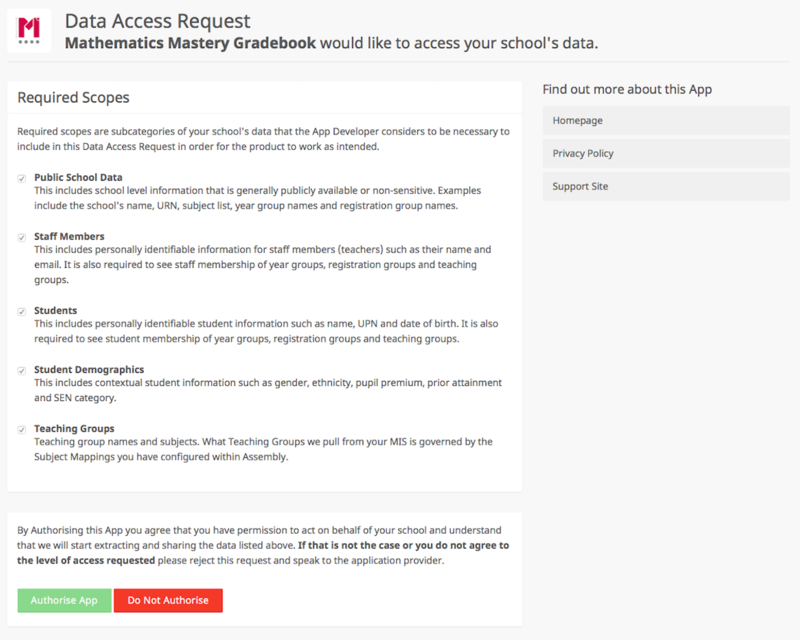 The data access request clearly shows the scopes of data which the app will have access to. No sensitive data can flow until you grant your first data access request, and we can only extract those scopes you've authorised (regardless of which SIMS permission groups are associated with the Assembly User). We also give you the ability to see which scopes have been authorised for which apps in our admin dashboard.